And if you’re on the fence and want to get started yourself, these stories are just a drop in the bucket! If you want to read more of the amazing success stories that are pouring in and join the discussions, you can join the Tribe for free for your first 7 days (normally $27/month). Are you getting results from eating and living Wild? Leave a comment on social media (Twitter, Instagram, or Facebook) to let us know how you’re doing! 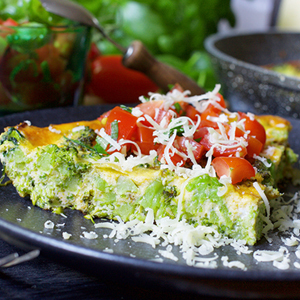 Meet your new friend, the Green Monster Frittata with Bruchetta. If you can scramble an egg, you can make this masterpiece in jiffy.